Sign up at janice@wildsouth.org or 256-974-6166. Advance registration is required. Please include your phone number when you sign up. 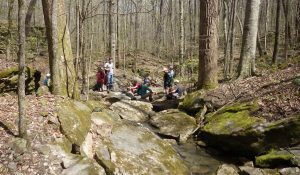 We are offering this hike in addition to the Sipsey Wilderness botanical hike which will be led by Kevin England on the same day. The botanical hike is full and there is a waiting list. 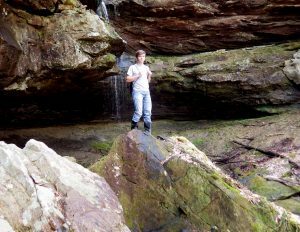 Hike description: Gillespie Creek runs through Indian Tomb Hollow in the northern section of the Bankhead National Forest. On this hike, we will park cars at the entrance to Indian Tomb Hollow on Alexander Motorway then drive around to begin our hike at Old Beulah Church on Pinhook Road where we will access the headwaters of Gillespie Creek. This is the perfect time of year for this hike – before the canopy is full, while the spring ephemeral wildflowers are blooming and the waterfalls are flowing from winter rains. The only trail on this hike is on the last third of the route. The terrain is steep in some places, and quite rough. The route proceeds first through sandstone topography where we will descend into a rugged canyon with tall bluffs and waterfalls. The hike will continue downstream into limestone territory and the botanical wonderland of Indian Tomb Hollow, Indian Tomb Hollow Cemetery and an Indian marker tree. Bring a small backpack with lunch, snacks and drinking water. There will be ticks. We recommend Permanone or Sawyer’s, the kind of repellent that you spray on your clothes and not on your skin. It really works. Spray clothing about 4 hours in advance so it has time to dry. The best part is that it has no scent! Footwear should be sturdy and protective with closed toes and good good tread for traction on steep slopes, uneven footing and slick rocks. There will be narrow creek crossings. Dress for the weather and for protection from briars. Long pants are strongly recommended. Dogs are permitted on this hike but they must be well-behaved, friendly, non-threatening, get along well with other dogs and must be kept on a leash at all times. After signing up, meet the group at 9:00 a.m. at the Wild South office (see map link above). Wild South hikes are free of charge and are are part of Wild South’s Outreach and Education Program, which is supported entirely by individual donations. There will be a donation bucket on the picnic table at the Wild South office for those who wish to donate to the program. Or click here to donate online. Thank you for your support!